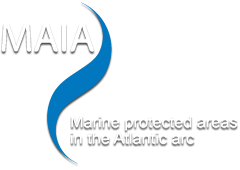 MAIA’s ambition is to integrate all marine protected areas officially recognised as such by the five countries bordering the North-East Atlantic (Ireland, the UK, France, Spain and Portugal), whether they are coastal or offshore, and totally or partially marine. the Marine Strategy Framework Directive. Three of the five regions defined by the OSPAR Convention: III The Celtic Seas, IV Bay of Biscay and Iberian Coast, V Wider Atlantic. The areas of three Regional Advisory Councils: North Western Waters RAC, South Western Waters RAC, and part of the Long Distance RAC. The MAIA 2010-2012 project receives funding under the European Interreg IV B Atlantic Area programme which defines areas of eligibility consisting of 40 regions according to the European nomenclature NUTS2, from the Highlands in the north of Scotland to Andalusia in southern Spain. Zoning defined by the European Interreg IV B Atlantic Area programme. Map of the Common Fisheries Policy zoning relative to the Regional Advisory Council (RAC) areas. the High Seas / Long Distance Fleet. Je viens de consulter cette page, http://www.maia-network.org/homepage/the_project/maia_application_area, je te la conseille.